Gilbert, AZ – August 5, 2015 – Cienna is a beautiful, six year old mixed breed dog. She was a very silly, playful dog until being diagnosed with a brain tumor, which made her lethargic and inactive. But 2 1/2 months ago, she received a revolutionary new treatment, and now she’s back to chasing her large Labrador brother around the house. for care – traditional radiation therapy, surgery, and/or chemotherapy. 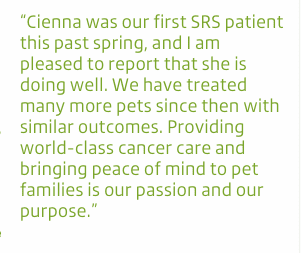 Fortunately for her, Arizona Veterinary Oncology (AVO) in Gilbert, Arizona, has chosen to partner with PetCure Oncology, a new company offering advanced radiation therapy including stereotactic radiosurgery (SRS). SRS is a treatment proven successful in human cancer care and is designed to cure, not merely ease the symptoms of cancer. Plus, it delivers a precise dose of radiation with sub-millimeter accuracy almost anywhere in a pet’s body and requires far fewer treatment sessions than traditional radiation therapy – so side effects are greatly reduced. Pets are at risk of getting cancer just like humans. Of the estimated 70 – 80 million dogs and 74 – 96 million cats in the U.S., cancer accounts for nearly 50 percent of all disease-related pet deaths, and is the number one cause of death in older dogs and cats. PetCure Oncology’s mission is to revolutionize the delivery of cancer care for pets. Created by the founders of Accelitech® – developers of the largest privately held network of stereotactic radiosurgery centers in the human cancer market – PetCure Oncology has launched a national network of veterinary radiosurgery centers. AVO was the first site. The second site will open this month in Cincinnati, Ohio at Care Center. Many more locations across the country are in various stages of development. “We are honored to be associated with AVO, Dr. Boshoven, and the incredible team of dedicated and experienced clinicians and support staff,” said Scott Milligan, PetCure Oncology CEO. “We are confident that our combined expertise and commitment to medical excellence will bring hope to many families, and comfort and extend the quality of life to many pets.